If you live in city limits, you probably don't give much thought to how the water you use each day gets into your house. Even small villages often provide a network of supply pipes that transport waterto each home in the neighborhood. The only thing you need to know is how to open the tap at the sink. Move a few miles out of town and the picture can change. While the inner workings are still (thankfully) invisible, your water supply is independent from your neighbors down the road. Water is drawn from groundwater wells that feed individual homes, instead of many houses. More than that, each home has its own electromechanical system (a water pump) for getting the water from the well to the house. But, just because your pump is out of sight doesn't mean it should be out of mind. 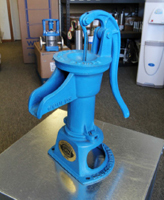 It is critical thatyou invest in the right water pump for your home or your business. Well pump systems should then be maintained on an annual basis to ensure small problems can be found and easily fixed before they become big problems leaving your clean water supply, and wallet, at risk. 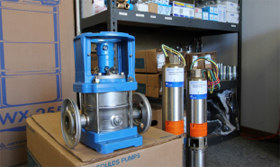 With over 35 years of experience, McMullen Water Systems should be your first choice for water well pump sales, pump service and pump installation. Please call or contact us today for an estimate.